PoPville » Why Does Art Have to be Exclusive? Why Does Art Have to be Exclusive? That’s the question posed, and answered, by three year old Superfine! — The Fair, an emerging contemporary art fair coming to the District on October 31, taking over Union Market’s Dock 5. 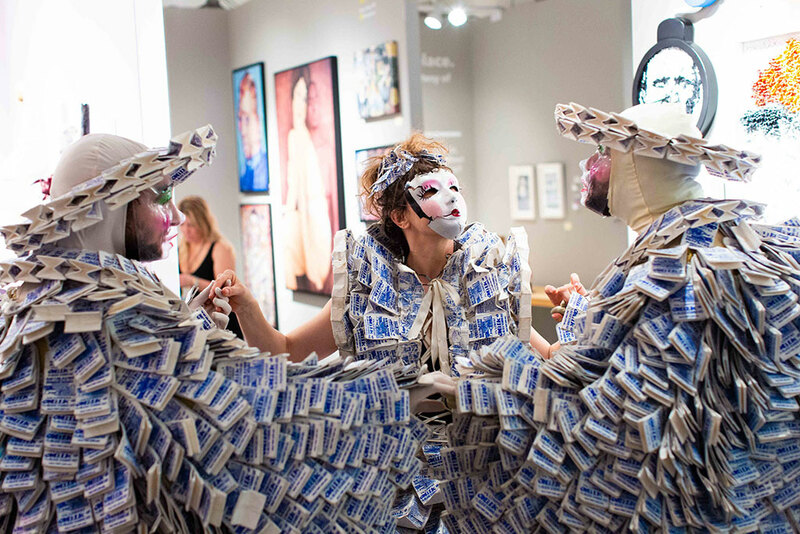 The four and a half day event launches with a Halloween masquerade vernissage (a fancy word for the opening preview party, with cotton candy topped champagne and costumed performance artists) and continues on until November 4, during which an expected crowd of more than 10,000 Washingtonians will pass through the art-filled halls. The fair, which also hosts editions in New York, Miami Beach and Los Angeles, boasts price points that veer towards the affordable end of the spectrum, with hundreds of original works of art in the $100s and 75% of the work on offer below $5,000. Superfine! prides itself on affordability and transparency, no “price upon request” here. An approachable art atmosphere means more opportunity for millennials and young professionals to cross the bridge from art-curious to full-fledged art collector. With more than 2,000 works on offer from 74 artists and galleries (50% of them local to the DMV area), even the most seasoned collector is bound to find artwork that speaks to them. Programming highlights include a Young Collectors’ Ice Cream Social on Friday, November 2. Hosted by Pink Line Project, The Young Collectors’ Ice Cream Social is where fair-goers can tuck into Union Market’s favorite Trickling Springs’ home-styled, organic ice cream while quaffing craft cocktails and vying for a $500 “art spree” voucher sponsored by the fair’s organizers. There will also be a performance art showcase on Saturday afternoon, curated by local D.C. non-profit gallery Transformer, and featuring rising stars of D.C.’s performance art scene including Hoesy Corona and Maps Glover, both of whom were featured at Platform in Athens earlier this year. A craft beer tasting by local brewery 3 Stars Brewing Company on the fair’s Ties Not Required Saturday night soirée rounds out a program full of opportunities for a younger demographic to engage with and collect incredible, original art by living artists. Superfine! DC takes place at Union Market’s Dock 5 from October 31-November 4, and tickets are available here. Want to see what a Superfine! fair looks like? Check out the video below to see their May fair in New York’s Meatpacking District.